The period from the 23rd of June to the 16th of July this year saw the holding of the Tir Fédéral in Bière, Switzerland. This is quite simply the largest shooting competition in the world by a big margin, and is held once every five years. The idea of the match is to promote marksmanship among the Swiss, whose Army is made up almost completely of part-time militia, however many foreigners attended, including myself! The courses of fire are based on ISSF rules, the only departure being that some courses of fire are shot with Swiss Ordnance weapons which do not meet ISSF rules, namely the SIG Stgw 57 and the newer SIG Stgw 90. There were ISSF pistol events and 300m rifle. 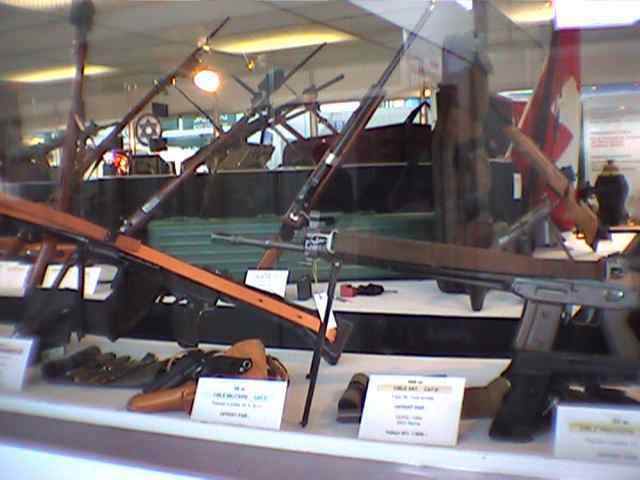 The rifle events were divided into four classes, Free rifle (i.e. 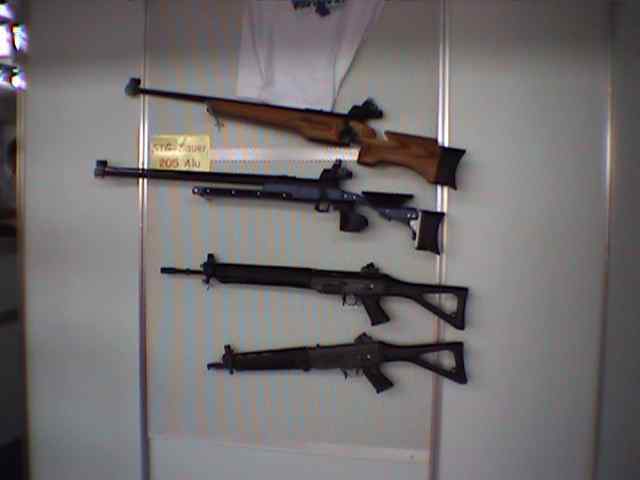 the rifles most commonly used in ISSF 300m), Stgw 57, Stgw 90 and a class for the various Schmidt-Rubin straight-pull rifles which pre-date the sturmgewehrs. By far the biggest entry was in the Stgw 90 class, and this class also had the most prizes available. The event attracted a staggering 60,000 competitors! It is difficult to describe the physical size of such an event. There were hundreds of firing points, divided across six separate ranges, all next to each other. You can get some idea from the official website. The courses of fire for the most part were fairly short and simple, something necessary no doubt due to the huge number of competitors taking part. 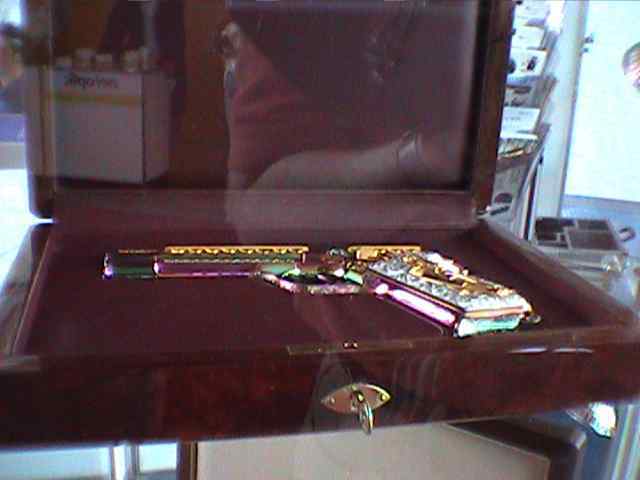 Scoring above a particular score earned a “distinction”, and the shooter qualified for a medal. Shooting my own Stgw 90, I managed to qualify for one distinction out of the several courses of fire that I shot, not bad considering no practice! Frankly it was difficult to know which target to shoot, there were so many of them in front of the firing point. To begin with you went to the sign-up desk and picked the courses of fire you wanted to shoot. Then after paying for them and receiving your Livret de Tir, you took your rifle to weapons control, who inspected it to make sure it complied with the rules. Then you went to the Stand de Tir that had been assigned for you to shoot at, and presented your Livret de Tir to the scorer. In this case a ten-year old girl, the system was so simple. The scorer asked which course of fire you wished to shoot first, pressed a barcode reader against the relevant code and it appeared on a screen next to your firing point. Then you shoot! The whole thing was scored automatically. After signing and accepting your score a score label was printed off and stuck in your Livret de Tir. If you had shot well enough, you then took your book to the medal desk who pressed their barcode reader against your book to see what you had won and handed you your medal. 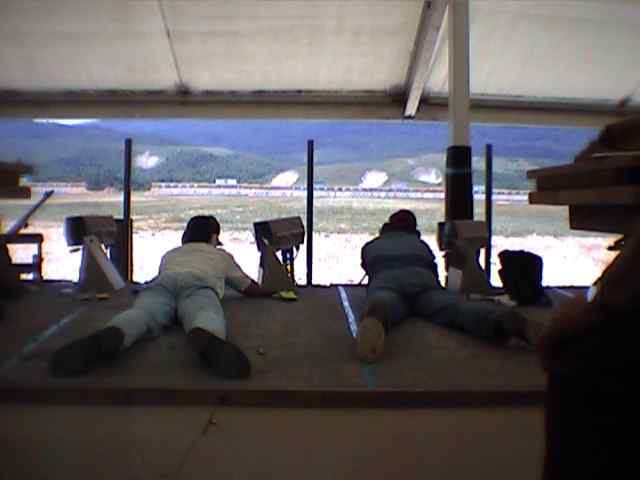 This picture shows shooters on the line. 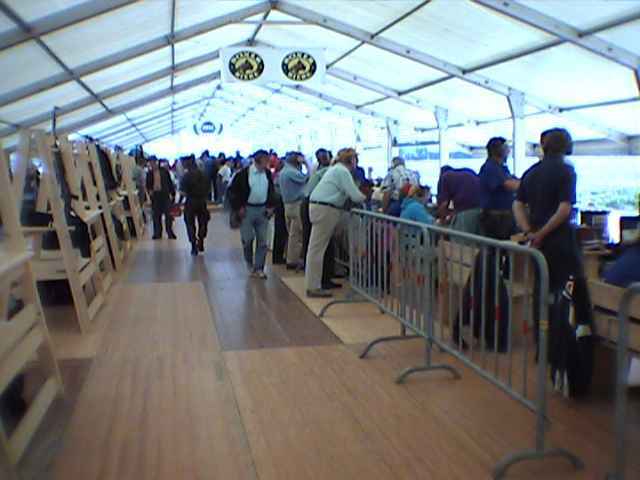 A view inside one of the Stand de Tir. Note the rifle racks along the back of the tent. In this shot you can clearly see the monitors by the side of the firing point that display the current score (supplied by Sius Ascor). Note also the targets in the distance. 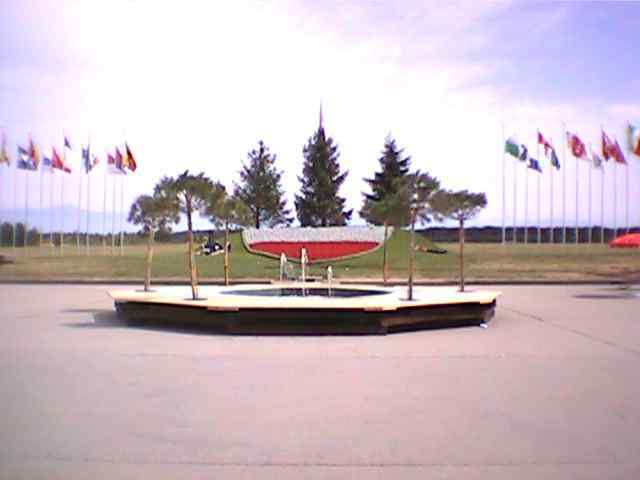 The display of Cantonal flags outside the exhibition hall. Hämmerli had a stand inside the main exhibition hall. 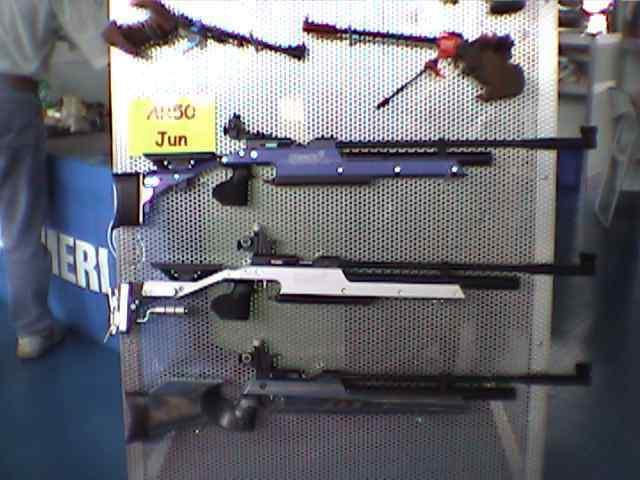 This is a display of AR50 air rifles. Not a very good picture of a SIG P210 commemorating the Cantons of Switzerland. An amazing work of art. A picture of part of the prize table! The amount of prizes was amazing, including new VW Beetles! Another shot from the Hämmerli stand. 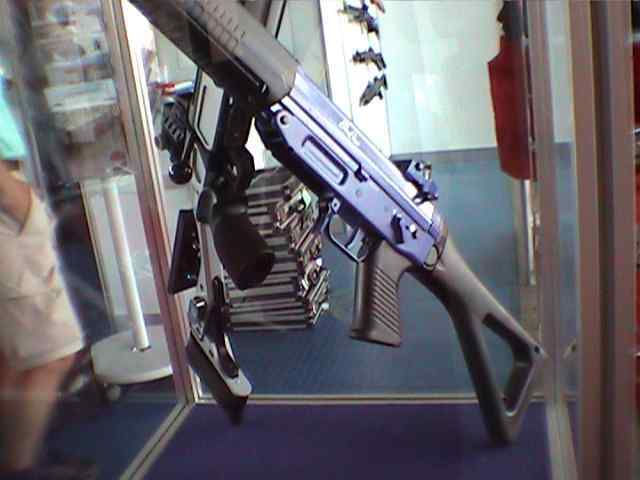 Of interest here is the second rifle down, a SIG-Sauer 205 ISSF rifle with aluminium stock. The SG550 below it is finished with a limited edition black finish. Now you can have a SG550 in blue! If you want to download the video, click here. You’ll need a player which can play AVI files, such as Windows Media Player. This entry was posted in Editorial, Target Shooting. Bookmark the permalink. ← …well, it wasn’t all bad.